Hindustan Global Software Technologies Delivered world-class Outsourced Product Development company in India. 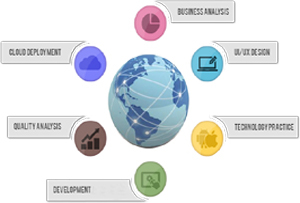 We specialize in Application Software development, Web-Development & Design, Mobile Apps, Work-Flow Management ERP/CRM Solution, CMS, SEO/SEM and On-Line and Retail Marketing and many other Functions Client usually prefer customer web application more than the ready-made ones because of the different requirement that occur due to the different business and work environments. Our system analysis process and experience gives HGS Technologies the capability of translating the client offline experience into an Online application that suits the needs 100% and ensures smooth transition between traditional methods and the online application.. HGS Technologies Business analysis teams bring extensive industry-specific expertise to fully capture both the vision and business requirements for the software product. Our technical analysts consult with your teams to propose proven yet innovative approaches for achieving the performance, functionality and interface requirements. And HGS Technologies Our Design Teams ensure the USER INTERFACE is intuitive and efficient for achieving business goals. HGS Technologies employs a global delivery model that provides optimal value and superior quality for our clients.